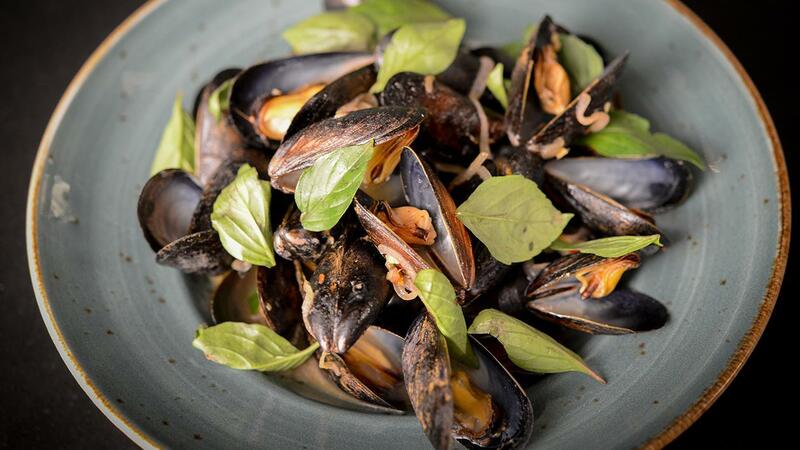 Tangy mussel dish with Thai mirepoix and tamarind. Heat 4 Tbsp of butter in pan over high heat. Add in shallots, ginger, and bird’s eye chili and sauté until transparent for 30 seconds. Add in tamarind, fish sauce, Knorr® Professional Liquid Concentrated Vegetable Base, water and mix until combined. Add in mussels and kefir lime leaves and cover. Swirl in 1 Tbsp of butter per serving of mussels. Serve in large bowl with Thai Basil as garnish.